I spent this October mixing monitors for Michael Ball & Alfie Boe on their Australian tour. With 20 people on stage all on in-ears, including a 6-piece string section, the show requires constant attention! Local suppliers JPJ Audio supplied a monitor system comprised of DiGiCo SD7 with SD-Rack, Sennheiser 2000-series RF IEMs/Shure P9HW hardwire IEMs and a DiGiCo SD10 at FOH. The tour took in most Australian big cities, including Brisbane, Sydney, Melbourne, Adelaide and Perth. I have just completed a short stint mixing monitors for Sir Tom Jones and his band. Starting with a few days of rehearsals, the shows consisted mainly of outdoor shows in varied venues such as forests, racecourses, beaches around the UK, as well as a one-off in an arena in Tel Aviv! As long-term audio supplier to Sir Tom, Major Tom supplied a full control system comprising a DiGiCo SD7 and Sennheiser 2000-series IEMs on monitors and Avid Profile at FOH. I also utilised my own RME MADIface USB for virtual soundcheck purposes. All-in-all, it was a very enjoyable few weeks with a superb, professional band. Standing for 'Youth of the Apocalypse', this side project by Jamie Reynolds (Klaxons) and Jeff Wootton (Gorillaz) performed their debut tour last week, culminating in a sold out show at The Hope & Ruin at The Great Escape festival in Brighton. I was bought in as FOH engineer, and with a tour consisting of small clubs around the UK including Moles in Bath, The Kasbah in Coventry and Esquires in Bedford, the tour certainly was challenging from an audio point of view! 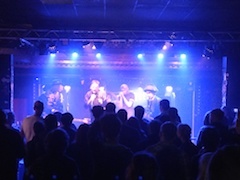 I love a challenge though, the band had a great time and the new, previously unheard material went down really well! Through the beginning of 2017, I have been working as FOH engineer for Madden. An upcoming Norwegian artist, his breakthrough single 'Golden Light' has currently clocked up over 80 million streams on Spotify. This week, he played 2 breakthrough shows at by:Larm, performing at both Rockefeller and Sentrum Scene in Oslo. With more shows and new music in the pipeline, this project shows huge potential! 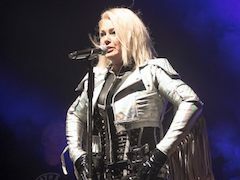 As her regular monitor mixer, this autumn I yet again joined Kim Wilde on tour in the Netherlands and Australia. While the backline and audio package could be trucked around Netherlands in a 7.5T truck, Australia provided a particular challenge as the itinerary required a lot of flying. Therefore, I cut down the SD8 at monitors to an SD11, utilising an iPad running TouchOSC to provide additional control. With FOH also using an SD11 and sharing a D-Rack, the system worked really well and meant we only had to rely on the venue for PA, stage cabling and mic stands. Everything else flew! 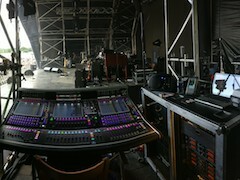 For the past few years, I've mixed monitors for the house band at the Rewind festivals held in Perth, Cheshire and Henley-on-Thames, and this year was no exception. Taking in a roster of artists including Rick Astley, Holly Johnson, Midge Ure, Leo Sayer, Heather Small and many more, it comprises of 4 hour sets for the house band with just 5 minute changeovers, meaning organisation is key! This year I moved from a fully-loaded PM5D to a CL5 which provided me with more processing power, input and output channels, as well as virtual soundcheck capability with Dante networking. The show is 48 inputs (depending on artist requirements) and utilises 10 IEM mixes, 5 wedge mixes, side-fills and more. The CL5 gives me a little bit of breathing room for a few years! 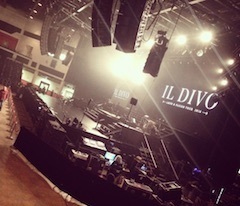 I've spent most of May and June looking after the monitor system for Il Divo's European 'Amor & Pasion' arena tour. The tour comprised 24 dates starting in UK before moving to the mainland visiting Germany, Switzerland, Poland, Spain, Portugal and more. 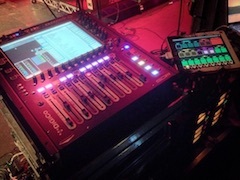 The system, supplied by Capital Sound, comprised of a DiGiCo SD10 with Sennheiser 2000 IEMs, Martin Audio LE1500 wedges and Outline Mantas side fills.